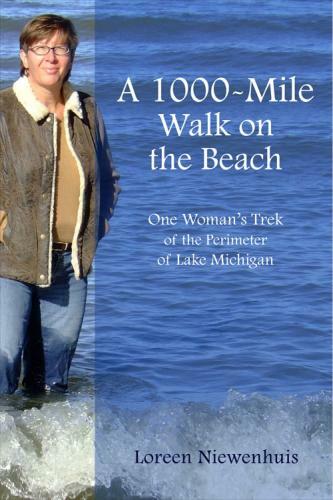 Author Loreen Niewenhuis has had the incredible fortune of seeing two of her books released in 2011, A 1-000 Mile Walk on the Beach and Atlanta. She’s working hard on a new manuscript as well. A Michigan resident, Loreen has found great success in creating an opportunity for herself that blends her genre interests and love of place writing. This interview took place recently and I am pleased to share the highlights today. Thanks for joining us, Loreen, and congratulations. With two books released in 2011, you’ve been busy! How do you manage your time? I’m quite lucky to be able to focus on my writing full-time at this point. Not that I’m making a living at it, but I’ve been a stay-at-home mom for a few years and have been able to devote increasingly more time to my writing as my sons have gotten older. The first book we’ve seen from you this year is A 1,000-MILE WALK ON THE BEACH, released in March by Crickhollow Books. What is your connection to Lake Michigan and what inspired you to make this figurative and literal journey? I’ve always been drawn to Lake Michigan. It’s the place I go to center myself. I reached a point in my life where I wanted to take on a big challenge, something that would test me, that I could throw myself into. I decided to take on the lake, to walk all the way around it. In a way, I internalized the lake by completely encircling it. You’re obviously familiar with the Great Lakes, but I’m sure you learned a great deal about your environment as you made the journey. What surprised you most about Lake Michigan? Walking the varied geology was a revelation to me. I knew that the Great Lakes were formed by glaciers, but to actually walk the entire shoreline of Lake Michigan gave me a unique perspective. I saw the hand of the glaciers in the perched dunes in Sleeping Bear Dunes National Lakeshore. I recognized the work of wind and waves to loft the massive sand dunes I climbed. Hiking the dense limestone deposits in Michigan’s Upper Peninsula and the eroding clay cliffs in Wisconsin completed the geological picture of the lake for me. I understand you’re now working on a new novel, TUMOR BOARD. Can you give us a hint of the premise? It takes place in Detroit in Grace Hospital which used to exist, but was torn down in the ’70s. Loreen, where can readers learn more about you and your work? The blog about my walk around Lake Michigan (where I continue to post information about the Great Lakes) is at http://laketrek.blogspot.com/. My author website is http://lniewenhuis.com/. I also have a fan page on Facebook where I post updates about readings and signings.